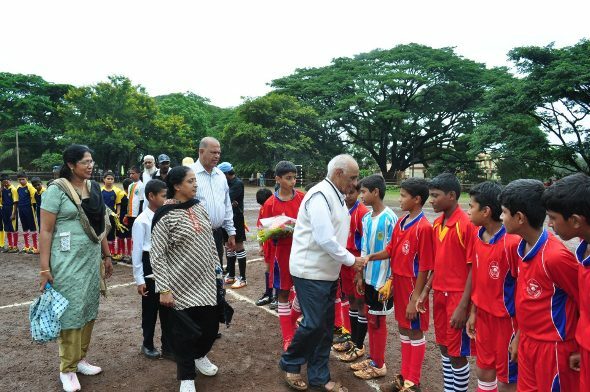 The Qualifying Round of the Royceton Gomes Memorial Cup Football Tournament 2012 commenced today and the Chief Guest of the inauguration ceremony was Mr. Shevantilal Shah, President of the Unaided Schools Management Association. The oath of the Tournament was recited by Omar Farooq from Lovedale School and the prayer was read out by Glen Carvalho from St. Paul’s High School. Twelve schools are participating in four Pools for he qualifiers– Lovedale School, Karnataka Daivajnya School, Madni School, Oriental School, Beynon Smith School, Kendriya Vidyalaya Sambra, Cantonment School, St. Mary’s School, Shaikh High School, Benson High School, KLE School and Precious Blossom School. The Winners and Runners-up of the Qualifying Round will meet the best 10 football school teams of last year in the Main Draw of this year’s Royceton Gomes Memorial Football Tournament 2012 which begins on 1st August, 2012 — Islamiya School, KLS School, Herwadkar School, MV Niketan School, MVM School, St. Xavier’s School, Phoenix School, St. Paul’s School, GG Chitnis School and Dnyan Prabodhan School. The finals is scheduled to be held on 7th August, 2012 on the ‘A’ Ground of St. Paul’s High School. The first match of the Royceton Gomes Memorial Cup Tournament was played between Lovedale School and Madni High School (10 – 0). The second match was between Benson High School Precious and Blossom School (7 – 0). The third match of the day saw Oriental High School play against Kendriya Vidyalaya Sambra (0 – 0).